When you wear jewelry that you designed, do people stop you on the street to ask where you found those great pieces? Do you tie a mean fishing lure? Do you paint murals on your dining room walls? If you love and excel at a particular hobby, starting an arts and crafts business may allow you to follow your bliss and create financial security at the same time. Most businesses exist to fill a market need and turn a profit. Arts and crafts businesses also weave the owners' passions into the equation. If you launch an arts and crafts business, prepare to make dozens of exciting decisions. There is no one-size-fits-all blueprint, and the choices you make will craft your business every bit as much as the art you produce. What is your competitive edge? One way to think of your edge is with this simple fill in the blank sentence, "[Your company name] is the only company that [insert advantage]." Decide how you will price your products, accounting for materials, time and overhead. You will have to compete against similar machine-made products, so remember that value, like beauty, is in the eye of the beholder. Consider how to position your product for a higher perceived value. For example, a consumer may not pay extra for a handmade snow globe, but a designer handcrafted snow globe featuring his favorite hobby, like alpine skiing or fly fishing, could command a handsome price. Whether you sell online or offline, countless marketing vehicles await you. Participate in arts and crafts booths, farmers' markets, and festivals in your area. Spread awareness through networking. Join local business groups, arts and crafts groups, and business meet-ups. Visit gift stores, and show product samples to the owners. If they like what they see and believe they can turn a profit on your products, they will buy. Engage in social media. Facebook, Twitter and Pinterest can be used to post photos of your work and help cultivate potential customers. The average post has a shelf life of three hours, so you can post frequently without taxing your channel. Use hashtags and post multiple times each day. Market with email. Collect addresses from customers, and let them know when you launch new products. Keep your target customer firmly in mind. Write a page about her, as if she were an individual. Give her a name. Consider her motivations. Think about where and with whom she spends her time. These are but a few examples. Be sure to incorporate a full marketing strategy into your business plan. How will you package your products? Tiffany has its blue boxes, and Coke has its cursive font. Understand that brands go far beyond packaging and business cards. Those things are important and must be distinctive and consistent, but they are only the beginning. Branding is all about setting expectations and keeping promises. It extends to the kind of warranty you offer and how you treat your customers. Production is the nuts and bolts of your business, and with a crafts business, you may have special challenges. How will you organize your workspace? You may opt to work out of your home or rent a space. Be sure to consider zoning laws and whether you have adequate storage space. What materials will you need and how will you decide which suppliers to use? If you make children's clothing, you will need fabric, thread, sewing machines, cutting tables, patterns, notions, labels, packaging materials, shipping products, and more. Perhaps a joint venture partner would defray some of those costs in exchange for having his company included on the label or affixed to the product. How will you scale your business up and down to accommodate buying seasons? Many business owners plan for the down times but are caught off guard when great things happen. If an order for 1,000 handmade quilts comes in, do you have access to temporary workers or contractors who can help you crank them out? Are you confident that the quality of their work will be up to par? Do you have short and long term goals for your business? If you make and sell pottery and an angel investor offers you $15,000, how will you use it? Decide where you will display your merchandise. If you opt to lease a storefront, it could double as a production and storage facility. Another option is to share space with another business. If your products are large and expensive to ship, it may be more cost effective to lease a storefront where customers can pick up their purchases than to ship. If your products are small and lightweight, showcasing and selling online may be the perfect venue. 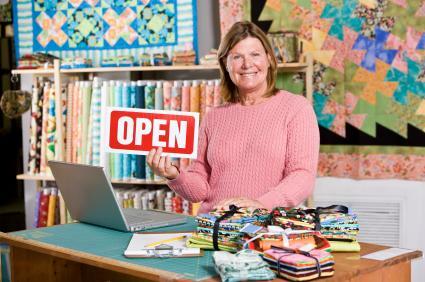 Entrepreneur Magazine reports that start-up costs for an arts and crafts business range from $2,000 to $10,000. The cash you need to get started may come from a variety of sources: savings, a loan from a 401K, a business loan or grant, or investors. When banks or investors see that your business plan is well thought out, your chances of attracting funding rise dramatically. Visit the website for your Secretary of State to register your business and learn about any license fees and taxes. Apply also for a federal employer identification number (EIN). Make it easy for customers to buy. One way to do that is to accept credit cards. If you are selling handcrafted dolls at an art fair and accept credit cards, you are more likely to score sales than a competitor who demands cash. Popular mobile card processing options include Square, PayPal Here, and Intuit GoPayment. Make your business decisions on paper initially, and allow your action plans and timelines to grow out of your business plan. Remember that business plans come with erasers; contracts don't. Nurture your passion for your craft, and strike a balance between the business and artistic elements of your enterprise.